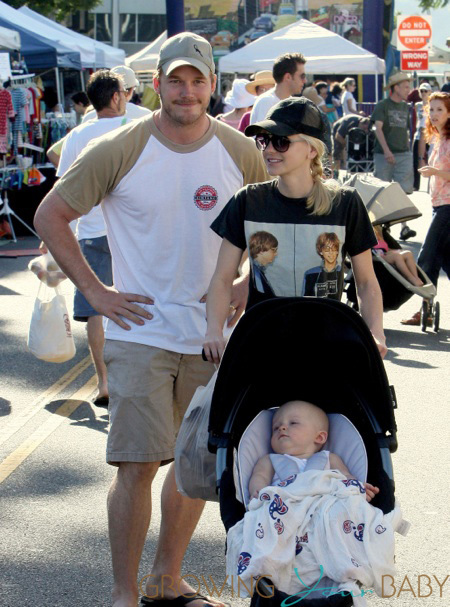 Anna Faris and husband, Chris Pratt, were spotted on a family outing with their now one-year-old son, Jack Pratt, at the farmer’s market in Studio City, California this Saturday. The Scary Movie star browsed the farmer’s markets stands wearing her favorite black baseball cap, dark sunglasses, black shorts and black t-shirt with an interesting mug shot on the front. She and husband Chris took turns pushing one-year-old Jack in his fancy 4 Moms Origami Stroller. Wrapped up in Aden + Anais Swaddle, Jack (who was born prematurely last year) was all smiles as Parks and Recreation star, Chris, stopped to chat with him. And despite his premature birth, Jack seems to be happy, healthy and growing rather well. Anna recently gushed about how great of a dad Chris is. Anna will star in the new CBS sitcom, Mom this fall. The show has been predicted to be one of the network’s strongest rookie comedies with Nate Corddry, French Steward, Sadie Calvano, Blake Garrett Rosenthal, Matt Jones and Spencer Daniels as co-stars.